Senator Kirsten Gillibrand of New York disclosed on Wednesday that she earned about $218,000 last year through her congressional salary and a book deal, becoming the first Democratic presidential candidate to disclose her most recent tax returns and issuing a challenge to her rivals to do to the same. In a tax return shared with The New York Times, Ms. Gillibrand stated that she earned $167,634 from her salary and an additional $50,000 through a book that she reported as business income. She paid $29,170 in federal taxes. Ms. Gillibrand, who is currently at the bottom of the polls, recorded a video touting the disclosure of her taxes as a step toward political transparency. She has made a practice of releasing her tax returns annually since 2012, when she posted her records going back to 2007. The latest disclosure may signal her intention to make transparency a central theme in her current campaign. Senator Bernie Sanders of Vermont, currently the leading declared candidate in the Democratic field, released only one year of tax information when he ran for president in 2016. He said after announcing his campaign in February that he would release 10 years of tax returns “soon,” but he has yet to provide them or set a deadline for doing so. A number of prominent candidates have disclosed aspects of their personal finances in congressional ethics forms, but have not released their tax returns to the public. Some, like Senators Kamala Harris of California and Cory Booker of New Jersey, provided reporters with access to some tax returns when they were candidates for the Senate. Others, like former Representative Beto O’Rourke of Texas, have never released their personal taxes. The issue of tax transparency has risen in importance for Democratic voters since the 2016 election, when President Trump refused to share his tax returns with the public, becoming the first presidential nominee in decades to flout the tradition. Democrats in the House of Representatives recently passed a broad government-ethics bill that would mandate that presidential candidates release their personal taxes. The bill is not expected to be voted on in the Senate, where Republicans are in the majority. It is no accident that Ms. Gillibrand is the first Democrat to share her most recent tax returns with the public. Trailing in early polls, she has been mounting an energetic rollout of her candidacy in recent weeks, branding herself as a “brave” politician, a term she used again in the video about her taxes. While she did not challenge any other Democratic candidates by name, the tax disclosure is a study in how underdog candidates may seek to break out from the pack by passing high-profile procedural or ideological litmus tests that more cautious candidates may struggle to clear. In the substance of her taxes, Ms. Gillibrand’s finances appear relatively straightforward: Her salary has consistently been her family’s primary source of income, with additional boosts coming periodically from book sales and the work of her husband, Jonathan. The Gillibrand family’s income fell in 2018 by about $36,000, compared with $253,273 the previous year, when Mr. Gillibrand reported earning a substantial sum for consulting work. 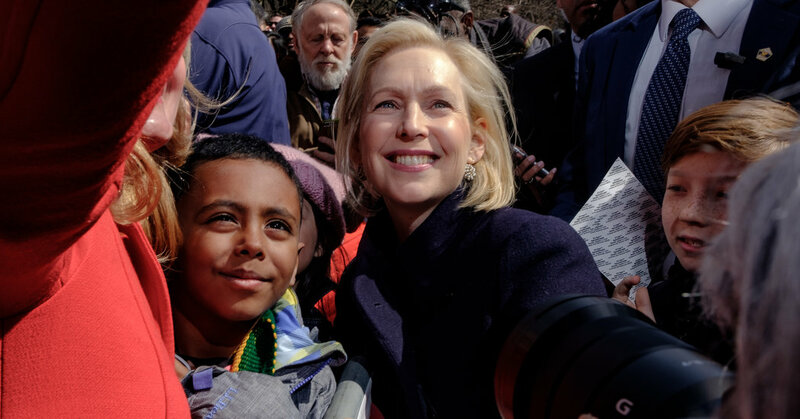 There was no income attributed to Mr. Gillibrand in 2018, and the family reported a $3,000 capital loss held over from a previous year. Her effective tax rate was 13.6 percent. Both Ms. Gillibrand and her husband checked the box on their tax return electing to contribute to the Presidential Campaign Fund, which provides for limited public financing of general election campaigns.